Lafcadio Hearn, aka Koizumi Yakumo. Patrick Lafcadio Hearn (June 27, 1850 – September 26, 1904), also known as Koizumi Yakumo (小泉八雲, Koizumi Yakumo) after gaining Japanese citizenship, was an author, writer, translator and teacher, best known for his books about Japan. Born in Greece and raised in Wales, he emigrated to the United States at the age of 19 and rose to prominence as a reporter for the Cincinnati Daily Enquirer. He lived in New Orleans for nearly a decade, and his writings about New Orleans and its environs for national publications, such as Harper's Weekly and Scribner's Magazine, helped mold the popular image of New Orleans as a colorful place with a distinct culture, more akin to Europe and the Caribbean than to the rest of North America. In 1890, Harper’s sent Hearn to Japan as a newspaper correspondent, and there he found his home and his greatest inspiration. He soon took up a teaching position in Matsue, a town in western Japan on the coast of the Sea of Japan. In 1891, Hearn married a samurai, Setsu Koizumi, and in 1895, he became a naturalized Japanese, taking the name Koizumi Yakumo. Hearn's books about Japan, Exotics and Retrospective (1898), In Ghostly Japan (1899), Shadowings (1900), A Japanese Miscellany (1901), and Japan, an Attempt at an Interpretation (1904), helped to introduce Japan to the Western world. Hearn is especially well-known for his collections of Japanese legends and ghost stories, such as Kwaidan: Stories and Studies of Strange Things. Hearn’s father moved the family to Dublin, Ireland, when he was two years old, and his parents soon divorced. His mother returned to Greece, and his father took service in India. Lafcadio’s brother was sent to a boarding school, and he was placed in the care of an aunt in Wales, who was a Roman Catholic. His father's brother, Richard, was at one time a well-known member of the Barbizon set of artists, and Lafcadio seemed to have inherited his family's artistic and rather bohemian tastes. In his early years, he received an informal education, but records show that by 1865 he was attending Ushaw Roman Catholic College, Durham. During his teens, he was injured in a playground accident and lost the vision in his left eye. His aunt died while he was still a youth. Hearn went to a Catholic college in France, but was disgusted with the life and gave up the Roman Catholic faith. At 19, Hearn was sent to live in the United States of America, where he settled in Cincinnati, Ohio. For a time, he lived in utter poverty, which may have contributed to his later paranoia and distrust of those around him. Eventually he was befriended by the English printer and communalist Henry Watkin, who helped him to pick up a living in the lower grades of newspaper work. He worked at various menial jobs and then on the Trade List, a business weekly. Through his talent as a writer, Hearn quickly advanced through the newspaper ranks and became a reporter for the Cincinnati Daily Enquirer, working for the paper from 1872 to 1875. Given creative freedom by one of Cincinnati's largest circulating newspapers, he developed a reputation as the paper's premier sensational journalist, as well as the author of sensitive, dark, and fascinating accounts of Cincinnati's disadvantaged. He continued to occupy himself with journalism and with out-of-the-way observation and reading, while developing erratic, romantic, and rather morbid idiosyncrasies. While in Cincinnati, he married a black woman, Alethea ("Mattie") Foley, an illegal act at the time. When the scandal was discovered and made public, he was fired from the Enquirer and went to work for the rival Cincinnati Commercial, where his writing included prose poems and essays on themes unusual for that time, such as the life of urban blacks. In 1874 Hearn and the young Henry Farny, later a renowned painter of the American West, wrote, illustrated, and published a weekly journal of art, literature, and satire entitled Ye Giglampz that ran for nine issues. The Cincinnati Public Library reprinted a facsimile of all nine issues in 1983. During his time in Cincinnati, he also translated some stories by the French writer Theophile Gautier, published in 1882 as One of Cleopatra’s Nights; and Gustave Flaubert's Temptation of St. Anthony (published posthumously). In the autumn of 1877, Hearn left Cincinnati for New Orleans, Louisiana, where he initially wrote dispatches on his discoveries in the "Gateway to the Tropics" for the Cincinnati Commercial. He lived in New Orleans for nearly a decade, writing first for the Daily City Item and later for the Times Democrat. He contributed translations of French authors; original stories and sketches; and adaptations from foreign literature which were published in two of his earliest works, Stray Leaves from Strange Literature (1884) and Some Chinese Ghosts (1887). He wrote articles on a wide variety of subjects, including science, Buddhism, Islam, French and Russian literature, and anti-Semitism in Russia and France. In 1889, Harper's sent Hearn to the West Indies as a correspondent. He spent two years in the islands and produced Two Years in the French West Indies and Youma, The Story of a West-Indian Slave, a highly original story of a slave insurrection (both 1890). 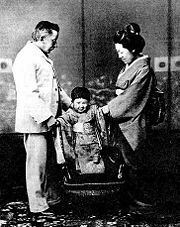 Lafcadio Hearn, shown with Setsu Koizumi and their first son. Note the way he is facing; he always preferred to be photographed this way so that his left eye could not be seen. In 1890, Hearn went to Japan with a commission as a newspaper correspondent for Harper’s, which was quickly broken off. It was in Japan, however, that he found his home and his greatest inspiration. Through the goodwill of Basil Hall Chamberlain, Hearn gained a teaching position in the summer of 1890 at the Shimane Prefectural Common Middle School and Normal School in Matsue, a town in western Japan on the coast of the Sea of Japan. Most Japanese identify Hearn with Matsue, as it was here that his image of Japan was molded. Today, The Lafcadio Hearn Memorial Museum (小泉八雲記念館) and Lafcadio Hearn's Old Residence (小泉八雲旧居) are still two of Matsue's most popular tourist attractions. During his 15-month stay in Matsue, Hearn met and married Setsu Koizumi, the daughter of a local high-ranking samurai family. Hearn's articles on Japan soon began appearing in The Atlantic Monthly and were syndicated in several newspapers in the United States. In late 1891, Hearn took another teaching position in Kumamoto, Kyushu, at the Fifth Higher Middle School, where he spent the next three years and completed his book Glimpses of Unfamiliar Japan (1894). In 1895, he became a naturalized Japanese, taking the name Koizumi Yakumo. In October, 1894, he secured a journalism position with the English-language Kobe Chronicle, and in 1896, with some assistance from Chamberlain, he began teaching English literature at Tokyo (Imperial) University, a post he held until 1903. In 1904, he was a professor at Waseda University. On September 26, 1904, he died of heart failure at the age of 54. Hearn’s copious writings about New Orleans and its environs, many of which have not been collected, include articles about the city's Creole population and distinctive cuisine, the French Opera, and Vodou. His writings for national publications, such as Harper's Weekly and Scribner's Magazine, helped mold the popular image of New Orleans as a colorful place with a distinct culture, more akin to Europe and the Caribbean than to the rest of North America. His best-known Louisiana works are Gombo Zhèbes, Little Dictionary of Creole Proverbs in Six Dialects (1885); La Cuisine Créole (1885), a collection of culinary recipes from leading chefs and noted Creole housewives who helped make New Orleans famous for its cuisine; and Chita: A Memory of Last Island, a novella based on the hurricane of 1856 first published in Harper's Monthly in 1888. Hearn was little known then, and even today he is relatively unknown outside the circle of New Orleans cultural devotees, but more books have been written about him than any former resident of New Orleans other than Louis Armstrong. His footprint in the history of Creole cooking is visible even today. Hearn's books and articles about Japan, written between 1896 and 1903, when he was a professor of English literature at the Imperial University of Tokyo, helped to introduce Japan to the Western world. Exotics and Retrospective (1898), In Ghostly Japan (1899), Shadowings (1900), and A Japanese Miscellany (1901) described the customs, religion, and literature of Japan. In the late nineteenth century Japan was still largely unknown to the Western world. With the introduction of Japanese aesthetics, however, particularly at the Paris World's Fair in 1900, the West developed an insatiable appetite for a seemingly exotic Japan, and Hearn became known to the world through the depth, originality, sincerity, and charm of his writings. Hearn was also an admirable letter-writer. Hearn is especially well-known for his collections of Japanese legends and ghost stories, such as Kwaidan: Stories and Studies of Strange Things (1904), a collection of stories of the supernatural and translations of haiku poetry. Hearn’s last and perhaps best-known work, Japan, an Attempt at an Interpretation (1904), a collection of lectures prepared for delivery at Cornell University, Ithaca, N.Y., was a departure from his earlier, idealized view of Japan. Hearn died before he could go to the United States and deliver the lectures. Though getting nearer than, perhaps, any other Westerner of the time, to an understanding of the Japanese, he felt himself to the end to be still an alien. Some later critics accused Hearn of exoticizing Japan, but as the man who gave the West some of its first glimpses into pre-industrial and Meiji Era Japan, his work still offers valuable insight today. The Japanese director Masaki Kobayashi adapted four Hearn tales into his 1965 film, Kwaidan. Several Hearn stories have been adapted by Ping Chong into his trademark puppet theatre, including the 1999 Kwaidan and the 2002 OBON: Tales of Moonlight and Rain. Hearn's life and works were celebrated in The Dream of a Summer Day, a play that toured Ireland in April and May 2005, which was staged by the Storytellers Theatre Company and directed by Liam Halligan. It is a detailed dramatization of Hearn's life, with four of his ghost stories woven in. A cultural center at the University of Durham is named for Hearn. Hearn, Lafcadio. 1894. Glimpses of unfamiliar Japan. Boston: Houghton, Mifflin and Co.
Hearn, Lafcadio. 1968. Kwaidan; stories and studies of strange things. New York: Dover Publications. Hearn, Lafcadio. 1904. Japan, an attempt at interpretation. New York: Macmillan Co.
Hearn, Lafcadio, and Bruce Rogers. 1896. Kokoro: hints and echoes of Japanese inner life. Boston: Houghton, Mifflin. ↑ Hearn's Parents Retrieved May 18, 2008. ↑ 2.0 2.1 Lafcadio Hearn and S. Frederick Starr Inventing New Orleans: Writings of Lafcadio Hearn Inventing New Orleans: Writings of Lafcadio Hearn (University Press of Mississippi, 2001, ISBN 1578063531). Retrieved May 18, 2008. ↑ Henry Tracy Kneeland, An interview with James Danial Hearn - Lafcadio Hearn's brother, Atlantic Monthly, January 1923. Retrieved May 18, 2008. ↑ A chronicle of Creole cuisine | Chron.com - Houston Chronicle. Retrieved May 18, 2008. ↑ Lafcadio Hearn Bibliography Retrieved May 18, 2008. Bisland, Elizabeth, Lafcadio Hearn, and Bruce Rogers. 1906. The life and letters of Lafcadio Hearn. Boston: Houghton, Mifflin and Co.
Dawson, Carl. Lafcadio Hearn and the vision of Japan. 1992. Baltimore: Johns Hopkins University Press. Kneeland, Henry Tracy. An interview with James Danial Hearn. Atlantic Monthly, pp. 20 -27. January 1923. Kunst, Arthur E. 1969. Lafcadio Hearn. New York: Twayne Publishers. Stevenson, Elizabeth. 1961. Lafcadio Hearn. New York: Macmillan. This page was last modified on 19 June 2018, at 16:04.